Cheese fanatics need to try this mountain of a burger. 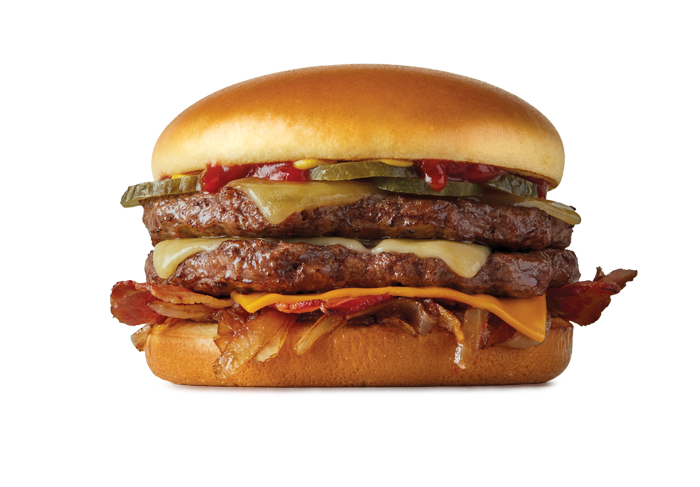 Delicious 100% NZ Angus beef with three slices of melted cheese, bacon and caramelised onions makes this a no fuss favourite for meat lovers. Available from 10.30am to 10.30pm at participating restaurants for a limited time. Serving Suggestion. GRILLED CARAMELISED ONIONS: Onion, Vegetable Oil (Palm and/or Cottonseed, Soybean), Salt, Sugar, Caramelised Sugar, Onion Powder, Maltodextrin, Flavours, Spice. KETCHUP: Water, Tomato Paste, High Fructose Corn Syrup, Corn Syrup, Distilled Vinegar, Salt, Natural Flavour. MUSTARD: Water, Distilled Vinegar, Mustard Seed, Salt, Colour (100), Paprika, Flavouring. Contain gluten, milk, soy & sesame seeds. May contain TRACES of sulphites. SEASONING: Salt, Black Pepper, Angus Seasoning [Maltodextrin (Maize), Salt, Dextrose (Tapioca, Maize), Dehydrated Vegetables (Onion, Garlic), Flavours (Milk, Soy), Spice (Pepper), Yeast Extract, Colour (150d), Canola Oil]. BEEF PATTY may be cooked on the same equipment as eggs.